The Friday before last, I was lucky enough to attend a spectacular holiday event at The Hermitage Hotel: The Escoffier Society Christmas Dinner. The annual five-course dinner, with exquisite wines matched to each course, gives Capitol Grille Chef Tyler Brown and his talented team a chance to really pull out all of the stops and create what could very well be the best meal served in Nashville all year. 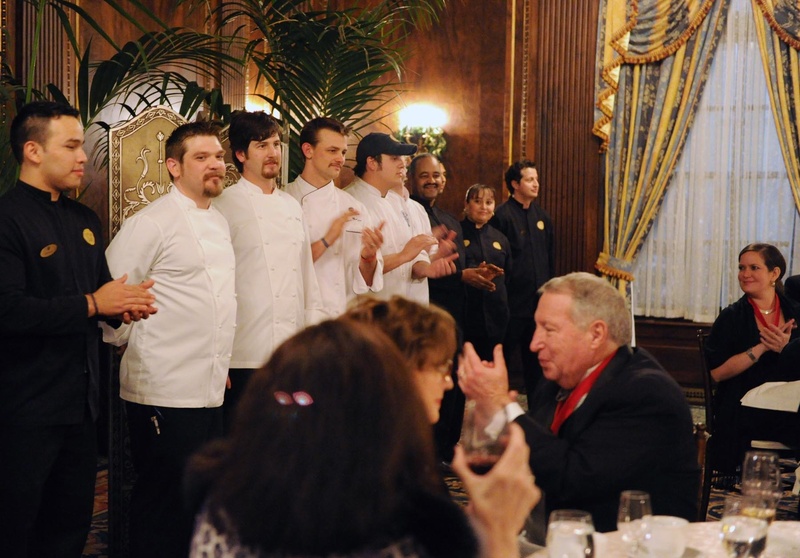 Capitol Grille Chef Tyler Brown (far left in a white coat) and his culinary team take a bow at the conclusion of the Escoffier Society Christmas Dinner at The Hermitage Hotel. Officially known as the Les Amis d’Escoffier Society of Nashville, the group of 100 or so friends who annually gather at The Hermitage Hotel – as well as at other local restaurants throughout the year – is named in honor of one of the greatest chefs of all time, Auguste Escoffier. The international society with which the Nashville chapter is affiliated was started in 1936 at the Waldorf-Astoria hotel in New York City. The purpose of the society is quite simple: to explore and enjoy fine food and drink. Under the leadership of president Fred Dettwiller, the Escoffier Society of Nashville has grown in recent years and sampled the fare of many of Nashville’s finest restaurants. But the highlight of every year, society members tell me, is invariably the Christmas dinner in the hotel’s Grand Ballroom, which has become a tradition over last five years. As a matter of fact, The Hermitage Hotel is the only establishment that the Escoffer Society regularly visits every year. This year, once again, the Capitol Grille culinary staff outdid themselves. The full menu and wine pairings is listed below. The hotel wanted me to pass along their special thanks to Damian Serong of Omni Beverge, who selected and provided the wonderful wines we enjoyed with our meal. Wherever you are and whatever it is you’re doing, stop for a moment and use your imagination with me. You’re a child again during Christmastime and you’ve come to The Hermitage Hotel. Your eyes widen as you enter the hotel’s elegant lobby, with it’s gilded décor, stained glass ceiling and elaborate holiday decorations. A three-tiered tower of holiday treats is placed in front of you along with a steaming pot of comforting tea as Santa Claus himself greets you before discussing what it is you would like for Christmas this year. I can hardly imagine an event more exciting for a child during the holidays. We simply cannot wait to see the expressions on the faces of children starting this weekend as we kick off our first Afternoon Tea with Santa event. This is the first time in our 99-year history that we have been privileged enough to host the jolly old elf himself. December 6 and 20th are both already sold out, but you can still make reservations for December 13 if you’re quick. Adult’s tickets are $35 and $15 for children under age 12. Get your seats before they’re gone! Call (615) 345-7149 to make reservations. Sharing a bite to eat with friends over drinks and great conversation is one of my favorite pastimes here in Nashville. If friends and family are coming to visit for the holidays and you’re planning on being downtown, take a break and pop in to the Oak Bar here at The Hermitage Hotel. The Oak Bar serves drinks and a casual dining menu from 11:30 am Monday through Saturday, starting at noon on Sunday, and doesn’t close until after midnight every day. It’s a nice little hideaway from the hustle and bustle of Music City that boasts a relaxing quiet atmosphere, perfect for catching up with old friends, winding down with co-workers, or discussing business with your clients or customers. Need another reason to visit? We are now offering happy hour pricing and 100 wines under $100. From 4:30 to 6:30 p.m. Happy Hour prices include $6 food plates, $6 glasses of wine, martinis for $5 and beers for $4. Food includes our ever-popular BBQ sliders, fried green tomato & pimento cheese bites and chicken confit spring rolls. As we hope you’ve all heard by now, we’re in the middle of celebrating our Centennial year as Nashville’s gathering place for locals, visitors and celebrities alike. To celebrate, we’ve created The Hermitage at 100: 100 wines for under $100 at our four-star restaurant, The Capitol Grille. Whether your favorite is a Cabernet, Pinot Gris, Chardonnay, Sauvignon Blanc, Riesling or Merlot, we’re confident you’ll find a bottle to suit your tastes.